I’ve always loved stationery and, in particular, good quality pens. I remember as a little girl, there was a Jeweller’s shop that my Mum would sometimes visit to have something repaired. It was the tiniest little Jewellers and, to my young eyes it was like entering Aladdin’s cave. Things glittering and glistening everywhere I looked. In the main cabinet sat what looked like hundreds of pens; Fountain pens, ballpoint pens, mechanical pencils, in colours ranging from jewel like gold and silver through to vivid reds and greens and with names such as Cross and Parker. Seeing the wonderment on my face, the Jeweller would often get one of the pretty pens out of the cabinet and let me see it close up (bear in mind, I must have been about 6 or 7 years old at the most so this was a really kind gesture on his part). 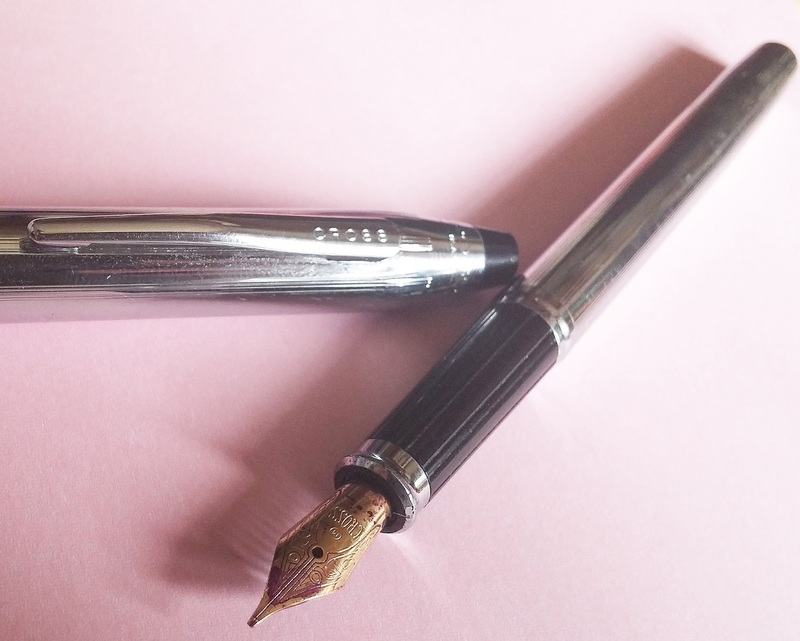 I always vowed that one day I would return to that Jewellers and buy a Cross pen but alas, by my teenage years the shop had closed down, but my desire to own a beautiful pen never waned. As a gift to myself when I achieved my degree, I bought a beautiful chrome Cross fountain pen. With its goldtone nib and polished chrome barrel, it was everything I had dreamed of owning as that awe filled child. Years later, when I achieved my masters I kept to the same theme and saved up to buy myself a beautiful Mont Blanc mechanical pencil to mark the occasion. I felt that I had achieved my pen goals, and have loyally used both writing instruments ever since. Recently I have befriended people who have similar stationery interests (read: obsessions) and who have introduced me to a whole new world of inks, washi tapes and pretty things. 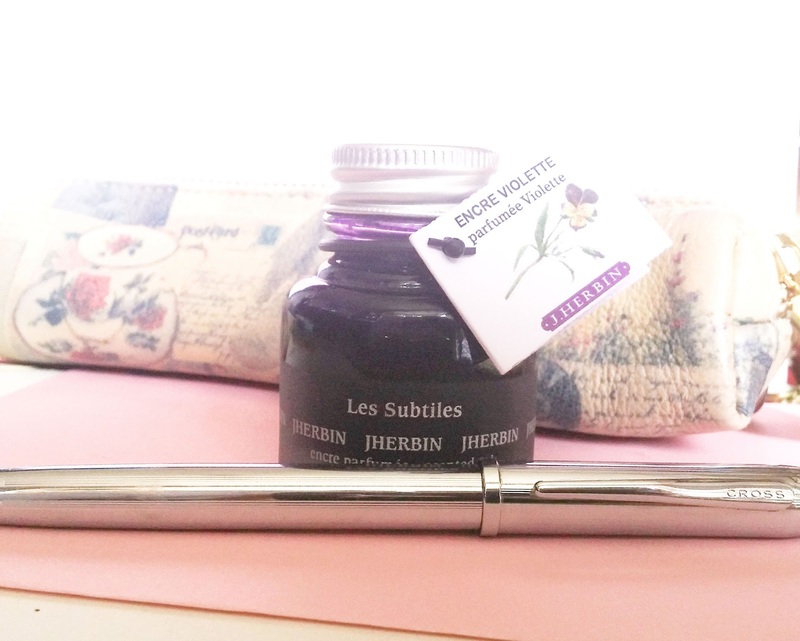 As a result of discussions with one particular ink addict, I bought myself a beautiful bottle of J. Herbin violet scented purple ink from Bureau Direct, which actually smells of Parma Violets as you write and brings a whole new level of luxury to writing notes in project meetings, not to mention the added finesse it brings to a spot of calligraphy. What I’m increasingly aware of is that there seems to be a real resurgence in popularity with all sorts of stationery. Me and one of my stationeryphile friends have recently started bullet journalling as a means of keeping well organised and on track with various personal and professional projects, and a search on Pinterest or Instagram reveals a whole subculture of people who are entirely obsessed by a whole range of beautiful stationery, letter writing (snail mail), journalling, bullet journalling, filofaxing… you name it, there’s an interest. It has me questioning though, is this a form of rebellion against the digital culture that we’ve all been encouraged to embrace? 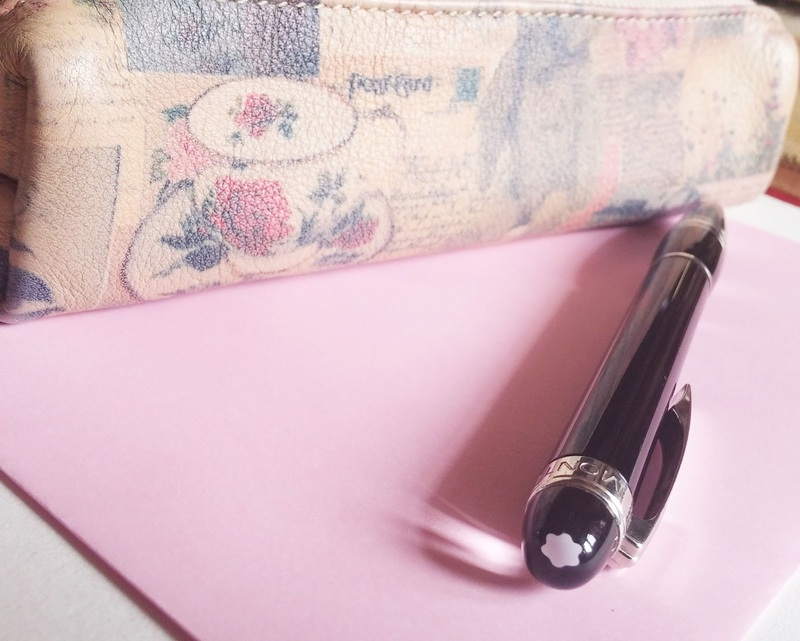 I’m an old-fashioned girl and whilst I am fairly attached to my smartphone, I have always favoured writing something down in a diary or notebook over putting reminders in my phone. I like to see what’s coming up long range, and paper just works better for me (I also like having nice books to write in and pens which is kind of negated by putting everything into a phone or laptop). With this being such a cultural shift, however, I do wonder if people are getting fed up of their lives being taken over by tech and want the slowed down mindfulness that having to write something down brings? A little bit of a calm in the chaos of a world full of screens. 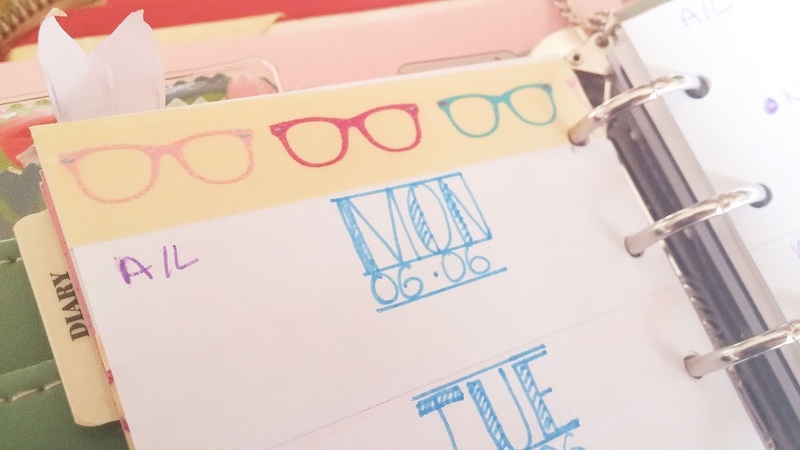 Personally, I’m more than happy to champion the stationery revolution, after all what’s not to love about writing that smells of Violets and sticky tape with glasses on? Such simple joys could never be achieved from the transient screens of any technology. What about you? Are you a little bit addicted to Stationery, or are you strictly digital? 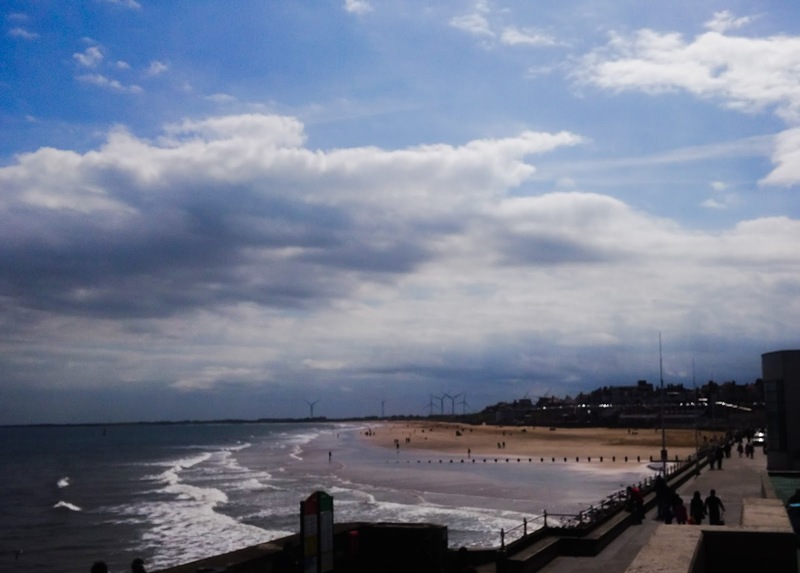 Despite the myriad of weather forecasters predicting doom and gloom over the weekend, the blustery but sunny days weren’t nearly as bad as expected (it’s very British of me that I can’t get through a blog post without mentioning the weather, isn’t it? I feel I have to justify my activities/ clothes/ photographs with whatever the weather was doing). It was a languid start to Saturday morning. Some gentle jazz music, sunshine pouring through the bay window, snoozing dogs and a late brunch before a failed attempt at trying to do Victory Rolls in my hair. I keep trying, and keep failing, my do looking more ‘Dracula, dead and loving it’ than Andrews Sisters. I have, by default, mastered a kind of faux victory roll now though. A runners-up prize of hairstyles which at least makes me look like I’ve attempted something. I won’t be defeated though, I will master the victory roll before this summer is out! Now I’ve said it on here, so I have to. Enough about my hair! We took a trip over to Bridlington since the Mr. had a painting exhibited in the Artwaves exhibition at the Spa. Our first stop, however, was a little retro boutique I’d spotted on my way into Bridlington last week, and hadn’t had time to pay a visit. 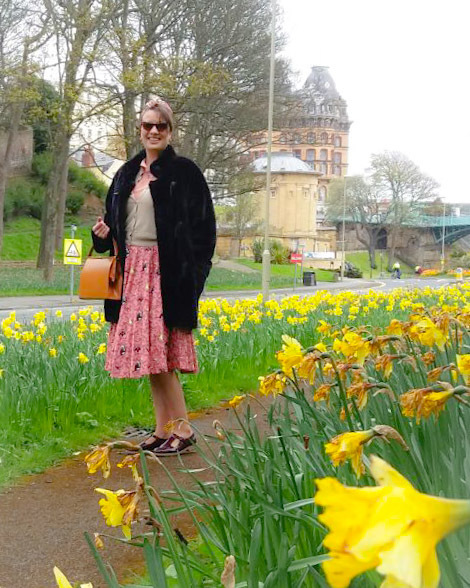 Angela Bare was a goldmine of Irregular Choice, Lindy Bop, Hell Bunny and all the usual suspects of vintage style dressing. I stumbled on a beautiful Hell Bunny Vixen dress and completely fell in love with its ladylike 1940s styling and the penny farthing print of the fabric. It fit like a dream, so the Mr. bought it for me. 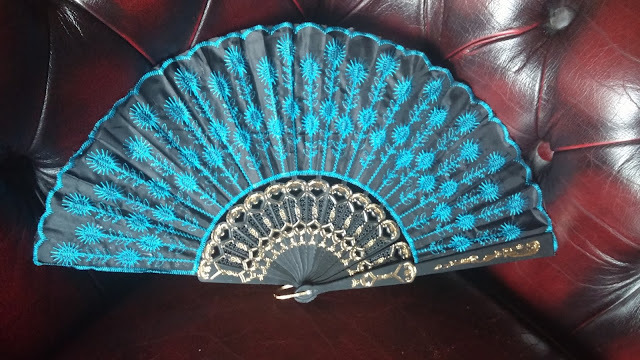 I can’t wait to wear it, and in my head I’m already thinking of all of the use it will get over the summer months. At the Spa, the Mr’s painting was hanging in the exhibition. It’s the first one he’s had in an exhibition since going professional about a year ago, and I was so proud to see it up in a public place. It looked fantastic. We enjoyed a light lunch seated right next to ‘The Odyssey’ which, in hindsight may not have been the best place to sit and eat since, it meant we were blocking the view of the artwork, but it did give us the perfect opportunity to take some photographs. I’m sure having your first painting in an exhibition is something to celebrate, yes? 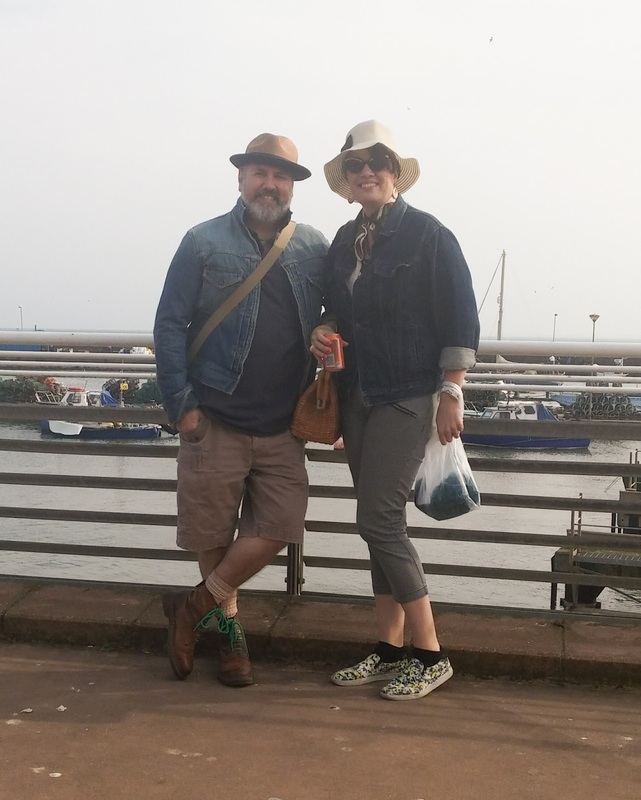 We didn’t stay too long at the Spa, taking a walk along the blustery seafront back into town. I like Bridlington sea front, it’s lovely to look along the coast to the windmills in the distance, and it gave a pleasant backdrop to capture my 1940s inspired outfit. 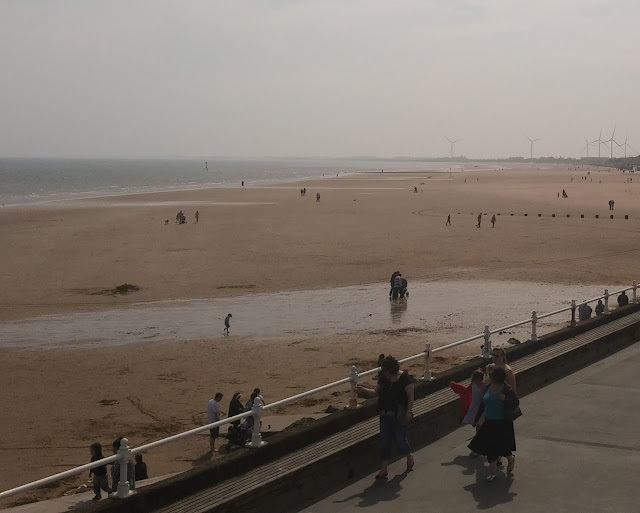 I don’t think I’ll ever tire of pictures by the seaside, it comes from having been land-locked for so much of my life. 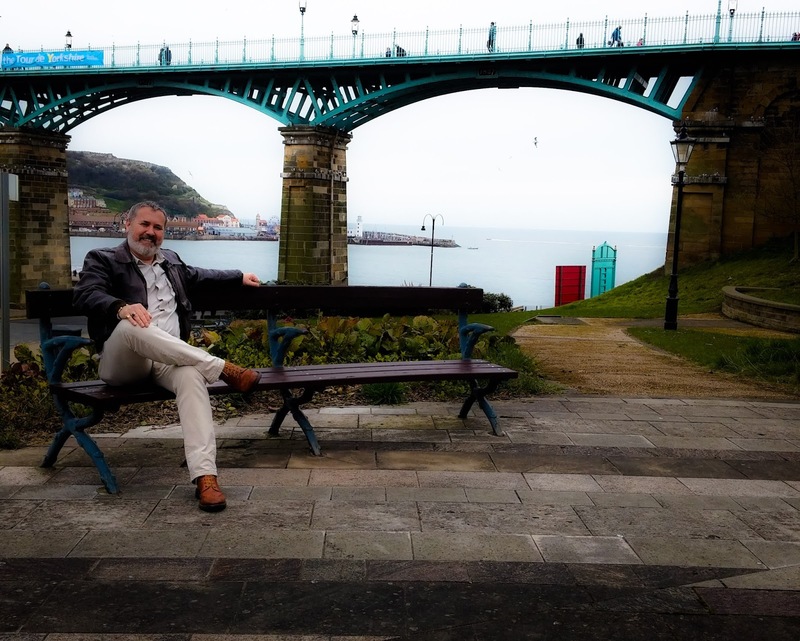 That said, the wind there isn’t always conducive to good outfit shots, and whilst my trousers are wide legged, they aren’t quite as wide legged as this photo would suggest! Our wander around town was fairly short lived, all I needed was a new mascara and an eyeliner, I thought it was finally time to ditch mine that I’ve been using for almost a year now. We finished off the day in a pub overlooking the harbour devouring a bowl of chips and a glass of wine… classy I know, but a pleasant finish to what had been a pleasant and relaxing day. Finally, we've got some sunshine. It's been a long time coming, but at least it's here. 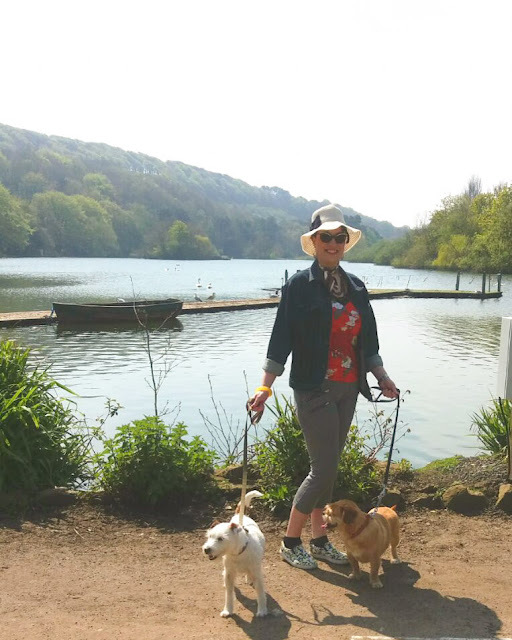 We took the dogs on a lovely long walk to the local lake. The Goslings are out with their very protective parents. It means you have to get past quickly with the pooches or risk getting goosed. Thankfully the dogs are fairly wary of swans and geese, and happy to get past quickly. 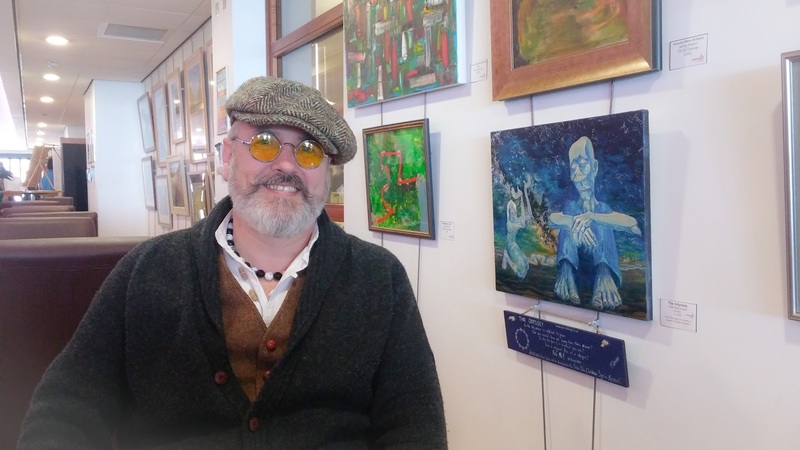 In the afternoon we popped over to Bridlington to drop off the Mr's painting at the Spa for the Artwaves exhibition. We also caught up with my friend Mrs. R for coffee and a wander. I bought a nice new frock and finally tracked down a fan for those hot summer days. Now I just need to wait for some hot summer days! The first UK bank holiday in May is almost always a weather wash out, and whilst this one wasn’t a total failure, it was far from ideal. Even so, it didn’t stop me from filling it with plenty of fabulous activities, making the most of the time I had. Friday evening I went out for a meal with friends then, onto a local karaoke. I’ve not been to a karaoke in at least 4 years, I used to love them so much and could clearly not contain my excitement at finally being let loose on one again. I bagged a total of 5 goes on the karaoke that evening, and doing Shirley Bassey’s Hey Big Spender was certainly my most fun one. Saturday morning I was pretty surprised to be honest to wake up without a sore throat. The Mr. and I popped to the local charity shops where I bagged an entire bolt of suiting material for a mere £10. 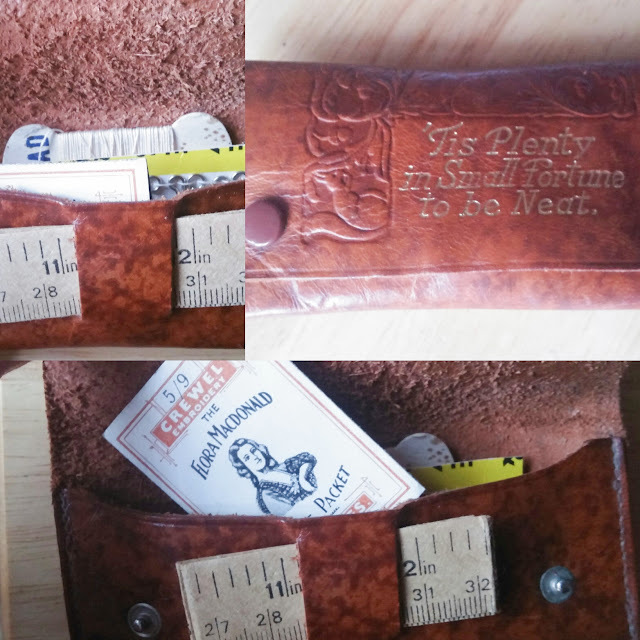 I’m not entirely sure what I’m going to make from it yet, but possibly a vintage suit or maybe some nice trousers and a waistcoat… who knows, but I couldn’t leave a bargain like that behind. I also bought myself some lovely orange leather gloves, which made the pain of losing my gorgeous purple suede ones earlier in the year slightly less painful. The afternoon involved a trip into town and the purchase of yet more fabric, as well as finally shelling out for the Dita Von Teese book, ‘Your Beauty Mark’. I spotted this book at Christmas and thought I’d hold out for it to go into the sale. It never went into the sale so I finally succumbed on Saturday, and then spent much of Saturday evening devouring its contents. 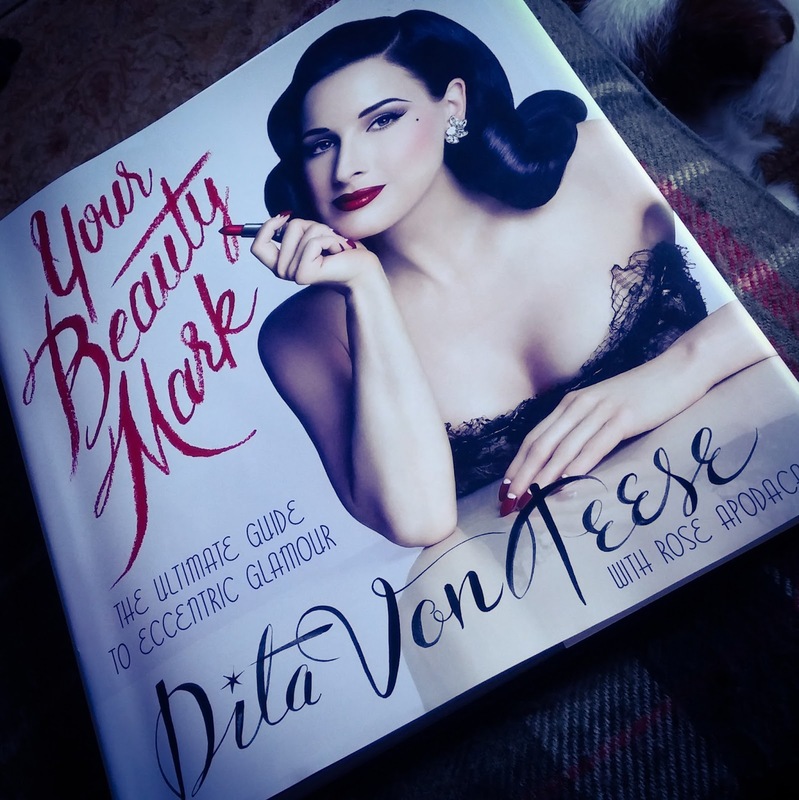 I’m a big Dita fan, so I’m biased, but this is a beautiful tome filled with the most gorgeous photography as well as all of Dita’s beauty secrets from hairstyles to nails and everything in between. Yep, I’m pleased with that purchase. 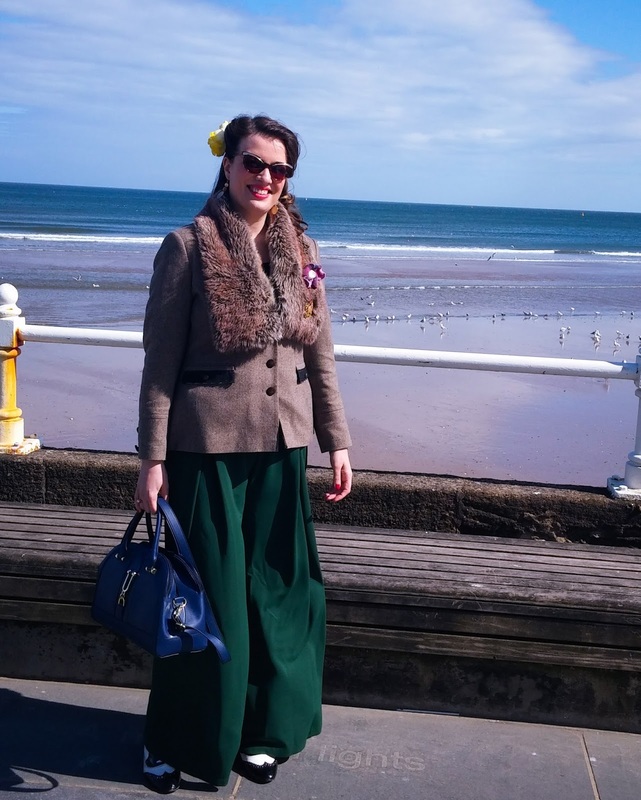 Sunday, it was a trip to the Scarborough Spa Vintage Fair. We arrived early and, because we thought the road might get closed off for the tour de Yorkshire, we parked a little farther away. That worked out perfectly though and I was able to get some lovely photos of my vintage outfit amongst lovely beds of daffodils on the walk down to the spa. 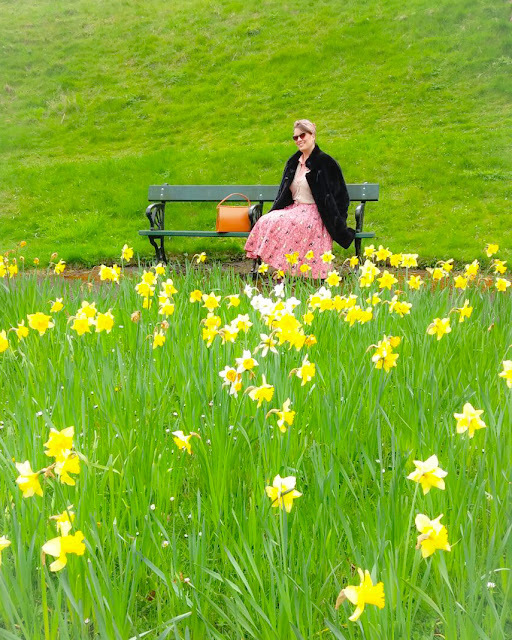 At least we can pretend spring is coming when the flowers are out… even if it is blisteringly cold. The fair was great, albeit absolutely packed. 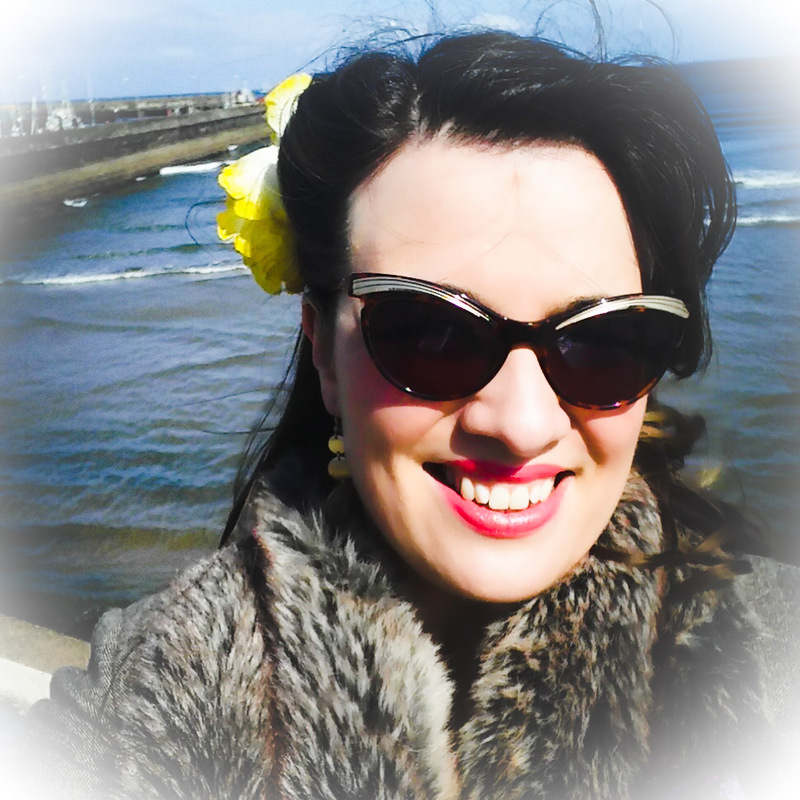 Note to self, I do not need a giant faux fur jacket when going to packed out vintage fairs! 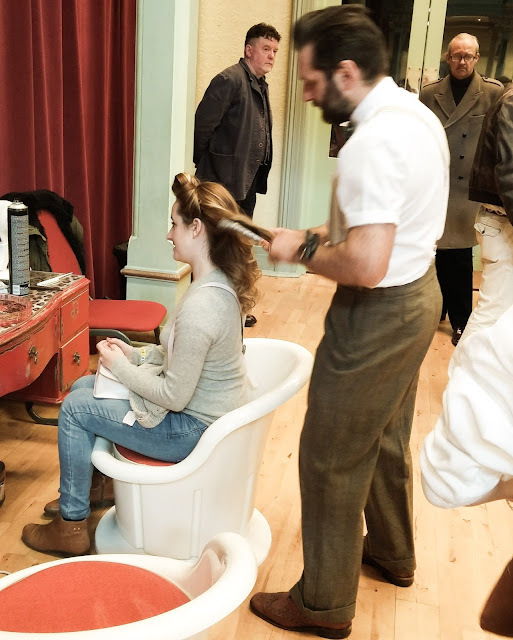 There were loads of stalls selling clothing and homewares, as well as vintage singers and a vintage hairstylist. He was turning out some fabulous updos which made me glad that he’s based nearby because the next time I’m going to something special I shall pay him a visit first. For my less special days, I really need to master some more vintage style hairdos myself. I’m pretty comfortable with the wet set now, and Sunday’s hair was a roll covered with a tied silk scarf, hiding a multitude of sins. I digress. 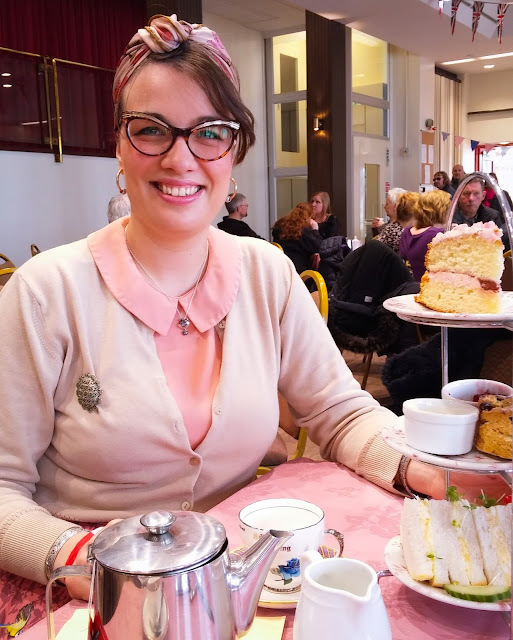 The Mr. and I shared a lovely cream tea, which was huge and had I eaten one to myself I would never have managed my lovely Sunday roast later that day. There were so many pretty things at the fair, but having spent the majority of my pocket money on fabric the day before, I was very restrained. I did get a lovely blouse though since, now I’m making lots of skirts, I’ve noted a few blouse shaped gaps in my wardrobe. I also bought this divine vintage sewing kit to carry in my handbag. No fear of wardrobe malfunctions while I’m out and about with this cutie little kit. Monday, I had intended to make a decent start on the skirt, which I had cut out on Sunday evening. 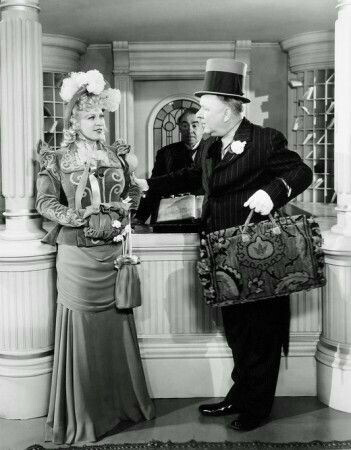 When it came to it though, I thought my time was far better spent watching ‘My Little Chickadee’ (because … Mae West and W. C. Fields) cooking a gorgeous roast vegetable lasagne, and, you guessed it, reading more of my Dita book. If only every weekend was so leisurely and filled with such glamour.